The latest sign of a housing boom: investors are clamoring to buy up homebuilding stocks, homes, and undeveloped land. Investors are betting big on the housing recovery. Hedge funds and private equity firms have been rushing in to buy up companies and assets in every part of the housing supply chain, including undeveloped land, homebuilders, foreclosed homes, and building parts manufacturers. One of the most notable moves is coming from hedge fund manager John Paulson, best known for his big (and lucrative) bets against subprime mortgages in 2006 and 2007. Now, he's turned his attention to snapping up undeveloped land in areas hardest hit by the housing crisis. "Land is the accordion in the home building equation," said Michael Barr, who runs Paulson's real estate investments. "It falls the most in a downturn, but also rises the most in an upturn." Over the past two years, Paulson & Co has bought up enough land in California, Arizona and Nevada to build up to 25,000 homes and is aggressively scouting for more, according to Barr. Private equity firms are also getting in on the game. Blackstone Group (BX) spent $2.7 billion last year to buy 17,000 single family homes, post-foreclosure, around the United States and plans to continue ramping up those efforts in 2013. Pine River Capital Management took real estate investment trust Silver Bay Realty Trust (SBY) public in December. Silver Bay, which acquires, renovates, leases and manages single family homes, has already purchased more than 2,500 homes in areas hard hit by the housing crisis. In a recent SEC filing, Silver Bay said that it plans to purchase 3,100 more homes. And in a sign of investors' growing appetite for a piece of the housing market, shares of publicly traded homebuilders have been soaring. PulteGroup (PHM), KB Home (KBH), and Lennar (LEN) are all trading near 52-week highs. Pulte's shares have more than doubled over the past year, while the KB Home and Lennar's shares have nearly doubled. And for the first time since 2004, homebuilders are testing the IPO waters. Tri Pointe Homes (TPH), which builds single family homes in California and Colorado raised $232 million through an IPO last week. Shares of the company, owned by Starwood Capital, rallied 20% on their first day of trading. Scottsdale, Ariz., homebuilder Taylor Morison has filed to go public and is expected to kick off its investor roadshow in the next few weeks. And building supply company Boise Cascade, jointly owned by PE firm Madison Dearborn and OfficeMax (OMX), plans to make its public debut next week. 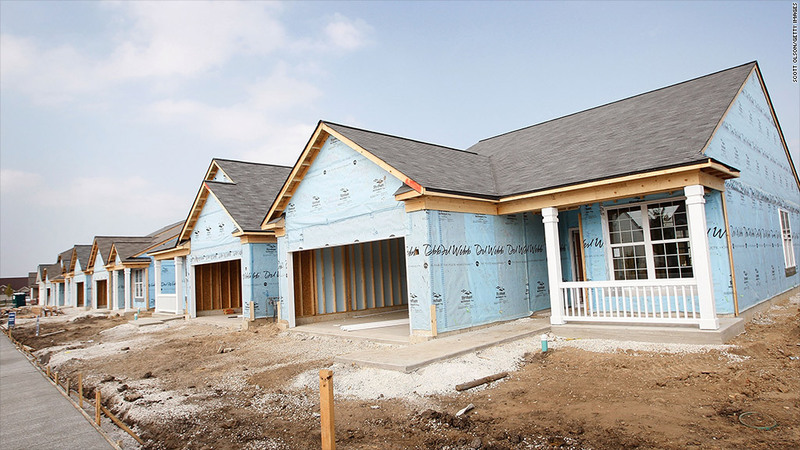 Investment bankers and IPO investors say they expect more homebuilders to go public this year. "As the sector rotates back into favor again, it makes sense for housing companies to monetize," said Brad Miller, co-head of global equity syndicates at Deutsche Bank. Brad Geisen, CEO of Foreclosure.com, which keeps a database of foreclosures around the nation, said he's been seeing a lot of interest from investors looking to buy up large numbers of foreclosed properties over the past three months. "A lot of investors see a short window of opportunity where there's good inventory on the market at bottom market prices," said Geisen. "No one knows how long it will last, so these investors are trying to buy as much as they can right now."